After the grandeur of the Town Hall, I find myself back in the more confined surroundings of the Victoria for an evening put on by local promoters Sound of Confusion. They specialise in noisy psychedelia, particularly the kind that was briefly popular in the late '80s/early '90s and made up a large proportion of my listening during my student days. First up is London act One Unique Signal, kicking in with some heavy, repetitive guitar riffs of the kind that dominated the works of Loop, who were one of my favourite acts in this genre. There is nothing particularly original going on here, in fact I'm even wondering at first if they are playing a cover of a Loop song, but I'm pleased to find that someone is still making this kind of music. It's all going fine until the guitarist opts to sing on one of the numbers, and does so in a rather bizarre growl. I'm not sure if this is down to his own efforts or if his voice is going through some kind of distortion effect, but the impression this creates is one of a slightly comical death metal band. The rest of the set is instrumental and I would advise them to keep it this way, or try some different vocal effects. They only play a short set, but this is not the last we will see of One Unique Signal tonight. I'm surprised that Einstellung are on next as I would have expected them to be higher up the bill, especially now that they get invited to play venues such as the Town Hall. Watching them for the second time in just a few days, in some ways it feels comforting and familiar to see them back in the kind of venue they are used to playing. Now I've seen them in a large venue, they do look kind of cramped on the Victoria's small stage but this obviously doesn't bother them. They give it everything they've got, still managing to create an infernal racket from a much smaller sound system. The set is pretty much the same as Thursday night's, again focused on the new album, with the same film playing behind them. The only difference seems to be that due to time constraints, the amusingly titled "Neu Ist Der Neue Neu" has been omitted. The Town Hall show has given me a deeper appreciation of the way their music is structured, and now even seeing them on a small stage again I notice minute details that I would probably have overlooked before. Their two shows this week remind me that it's great to have a band who can always give an exciting performance in any environment. There's not really much more to say that I haven't already said about the first show, except that anyone who hasn't heard them yet should head to their MySpace page or their manager's Krautcast radio site and check out the sounds available there. Jesus Deluxe don't really seem to fit with the overall mood of the evening. I can see why the promoters might have picked them to play as their fuzzy guitars sometimes hint at the poppy psychedelia of The Brian Jonestown Massacre. However, the singer, in both his vocal style and general appearance, reminds me of countless mediocre local indie bands who performed at the Flapper and the Jug of Ale in the mid-'90s. After a couple of songs, all I can think of is Verve (before they became The Verve). This is an evening of nostalgia, but Jesus Deluxe hark back to a period of indie history that I would rather forget. Even the band's name suggests bland, NME-approved indie. The atmosphere during the set is also rather unsettling. It soon transpires that it is the singer's stag night and he has brought with him a bunch of drunken friends, who stand at the front and chant like football fans. This is probably what it's like to be at an Oasis gig, but thankfully I have no first-hand experience of that. I'm relieved when the set finishes and the singer hurriedly leaves the room, taking his intoxicated rabble with him. When noisy, pre-Britpop indie is discussed, The Telescopes seem to be overlooked in favour of their contemporaries such as My Bloody Valentine, but of all the bands from that era, it is their recordings that I return to most often. They have gone through a number of changes in the past two decades, and the last time I saw them live they treated us to a set of minimal electronic drones, so far removed from their early work it was hard to believe it was the same band. 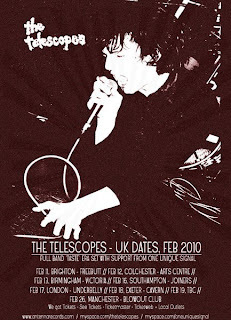 Having been absent for a few years, The Telescopes name has been resurrected but singer Stephen Lawrie is now the only original member remaining. Tonight we have been promised a full band set concentrating on early material, but I'm uncertain if these classics will retain the power of the original recordings or if the songs, and the singer, will have mellowed with age. The backing band that Stephen has assembled tonight is actually made up of the members of One Unique Signal, and it soon becomes obvious that there will be nothing mellow or ambient about tonight's set. Within moments of them walking onstage, I forget where I am and what year it is as they launch into "There Is No Floor". This is one of the most ferocious songs The Telescopes recorded in their first incarnation. I love the sense of mystery surrounding the song's central character, who lives on a non-existent floor, and also how it is really called "There Is No 13th Floor" but due to some unexplained superstitious belief the number 13 is never printed in the song's title or on the lyric sheet. The Telescopes manage to outdo even Einstellung in getting the maximum output from the small sound system, and immediately I'm hit by a tidal wave of noise, which sets the tone for the rest of the show. One Unique Signal do a fine job of reproducing the power of the original Telescopes line-up, and their performance here seems much more consistent than when they were playing their own material. The set is made up of most of the tracks from the "Taste" album, plus the two singles "To Kill A Slow Girl Walking" and "Precious Little". There is nothing post-1990, when the band entered their mellow, dreamy phase. This leads to a debate on whether Stephen should be so reliant on songs he wrote 20 years ago. I'm well aware that I criticised Sonic Boom for doing the same thing at a gig last year. For me, the main difference is that I never saw the Telescopes in their early years so it's the first time I've seen most of these songs performed live. You could argue that it's me, rather than Stephen Lawrie, who needs to move on from the music of the past, but I'm just happy that, for one evening at least, he is willing to indulge me in my musical fantasies. Another big difference between this and the Sonic Boom show is the relentless energy that Stephen injects into his performance. He is in no way a conventional frontman, and his onstage demeanour is just as I imagine it would have been 20 years ago. Perhaps in a deliberate homage to The Jesus and Mary Chain, he performs "Silent Water" with his back to the crowd. With a space at the front now vacated by the Jesus Deluxe stag party, Stephen is free to leave the stage and stumble around, dragging the mikestand behind him and colliding with anyone foolish enough to stand too close. He curls up in a foetal ball or rolls around the floor, frequently getting tangled up in his microphone cable. The anger, fear and frustration that he exudes can be uncomfortable in such a small room. Watching him up close, I'm not sure that this is just an act. Stephen looks genuinely tormented and I believe this is his way of dealing with traumatic events in his life. I have not seen a performance this cathartic since Michael Gira fronting Swans. As the final song, "Suicide", heads towards its ear-splitting climax, I begin to wonder what Stephen has in mind to finish the set. He picks up a bottle and I'm worried that he is going to do himself some serious harm, but instead he calmly leaves the room and sits alone outside to finish his drink, while the noise inside gradually diminishes to a single piece of feedback. This may seem like an anti-climax, but much of the excitement here comes not from Stephen's actions themselves but the tension of not knowing what he will do next. It reminds me that there was a time when gigs were often confrontational, and dangerous for both audience and performer. Today's live shows are often very safe in comparison and it makes me wonder how I would have coped seeing some of my favourite acts the first time round, for example the notorious JAMC gigs. Despite a couple of minor failures, overall this was a memorable night and I'm glad that Sound of Confusion share my enthusiasm for great music of the past. They usually put on a gig once a month. For info on their upcoming events, and to see the wonderful op art posters they create for each show, check out their MySpace page.